What makes up the regional economies? The role of sectors in the regions and their contribution to the national economy. 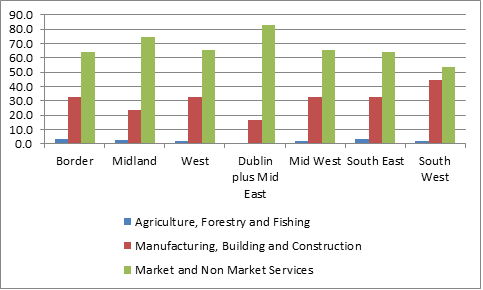 Continuing our examination of the recently published CSO figures on regional GDP, in this post the importance of the three main sectors (Agriculture, Forestry and Fishing; Manufacturing, Building and Construction; Market and Non Market Services) in the economy of each region and the regional economies’ contribution to national GDP for each sector is discussed. Before looking at the detail of the individual sectors it is useful to look briefly at the contribution of each of the regions to the national economy as shown in Figure 1 below. Dublin and the Mid East accounted for more than half of total national GVA in 2013, while the West produced just over 7% of national GVA and the Border region contributed almost 7% as did the Mid West. These three regions have counties covered by the WDC remit and are the main focus of this post. The contribution of the main sectors to the economy is shown in Figure 2. 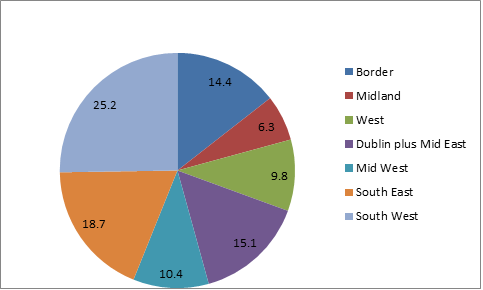 The importance of Services in all regions is clear but the role of Manufacturing Building and Construction in many of the regions outside Dublin and the Mid East is significant. In fact, it accounts for almost a third of the economy in both the West and Border regions (see Figures 3 and 4 below), while Services are almost two thirds of the economy. Despite the importance of Agriculture for employment in the region it contributed only a small amount to GVA in both regions (3.0% of the €12,177m GVA in 2013 (current prices) in the Border region and 1.9% of the €13,182m in the West. 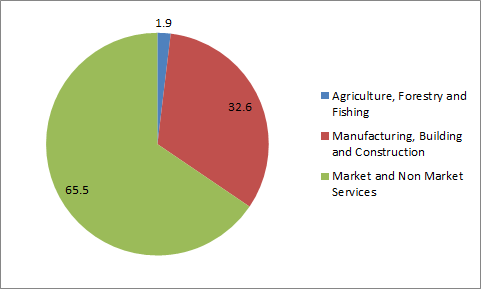 Even though only a small proportion of GVA is from Agriculture, Forestry and Fishing in these regions, they both make a substantial contribution to national Agriculture, Forestry and Fishing GVA (see Figure 5 below) with the Border accounting for more than 14.4% although the West contributes less than 10%, and the Mid West slightly more. This is, however in line with the national picture where Agriculture, Forestry and Fishing only accounts for 1.4% of GVA nationally in 2013. While Manufacturing, Building and Construction in important to both the Border and the West regions (almost a third of the regional economies) they both account for less than 10% of national GVA from this sector, highlighting the smaller size of these regional economies (Figure 6). 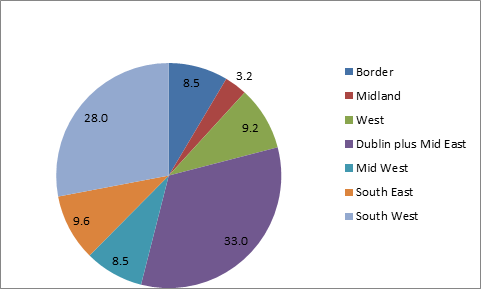 In contrast, the South West accounted for 28% of Manufacturing, Building and Construction GVA, compared to 33% from Dublin and the Mid-East. 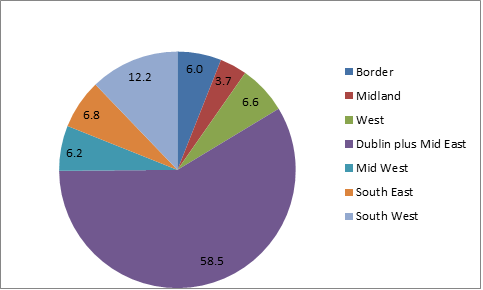 Finally, when we examine the regional economies contribution to GVA from Services the dominance of Dublin and the Mid East in this sector is unambiguous (Figure 7) accounting for almost 60% of the national GVA from this sector. In contrast both the West, Mid West and Border regions each only accounted for about 6% of national GVA from services even though it is very significant to the economy in those regions (almost two third of their economies come from services) and despite the likely significance of this sector in future economies.